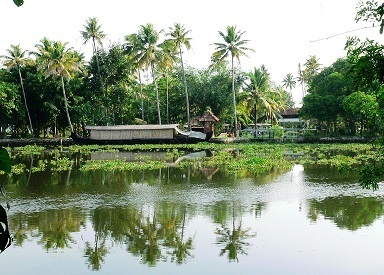 Kumarakom, believed to be the best backwater tourism option in Kerala, is also known for its mangrove forests. The recent history of the place is based around the construction of Thaneermukkom Bund between 1974 and 1976. The salt water barrier divides the Vembanad Lake helping farmers who do farming below sea level. The environmental impact includes the proliferation of water weeds and the deterioration of the fish population. Many luxury resorts are in the area, offering visitors options including boating, canoeing, and fishing.House boats are another popular option – a typical package includes cruising the lake, first-class overnight accommodation in the boat while docked in the middle of the lake, great seafood made to order by a private chef, etc – all this starting around Rs 10,000 or so. A snag though is that families with young kids generally do not enjoy the experience as much as adults do. 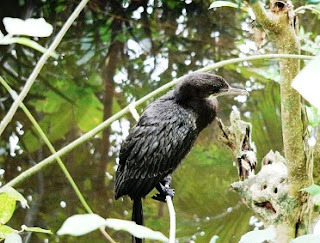 A major attraction of the area is the Bird Sanctuary, a 14-acre area developed in a rubber plantation (Baker’s estate) on the southern bank of the Kavanar River. Since birds start their day at the crack of dawn, it is better to be there at the opening time of 6AM. Kerala Tourism Development Corporation’s (KTDC) Waterscapes resort is a great choice, if a visit to the bird sanctuary ranks high in the priority list – it is the only one within the premises of the bird sanctuary . Being government run, it is to be expected that service levels are below par although the location and setting is unbeatable. If you opt for this, the best bet is to go for the Superior Lake View rooms as the Canal View rooms (slightly discounted alternative) is not very good as the water under those rooms are stale. Also, for a family of four, booking online will only allow for 3 adults - the rooms can accommodate up to 4 adults and so the difference need to paid while checking in. 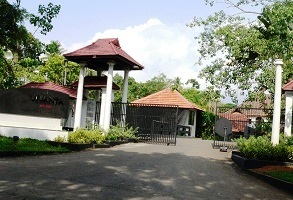 The bird sanctuary entrance is shared with the entrance to KTDC Waterscapes resort - it is located just before the bridge to Kavanattinkara and immediately after the Taj Garden Retreat Resort Complex. There is a small pedal boating area at the entrance whose open or closed status is dictated by the water level. One can opt for a guide to accompany you (Rs 250/-) – parking and other charges are very nominal. Many visitors choose to explore on their own – for those with a keen eye and ability to identify birds, this will work well. Salim Ali’s books are handy in this regard and his most popular work is “The Books of Indian Birds”. 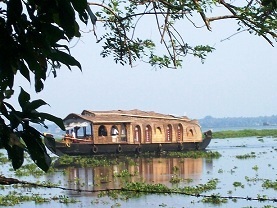 The initial portion of the walk is along the Kavanar River where houseboats are a common sight. At the bend, breathtaking views of the Vembanad Lake awaits. Parts of the Coconut Lagoon resort can also be seen across the waterway. The village of Ayemenem (Arudhati Roy’s God of Small Things) can be seen across the river way – one side is the village of Kumarakom and the other is the idyllic village of Ayemenem. The “History House” featured in the novel is now part of the Taj Garden Retreat Resort Complex, originally built by Alfred George Baker, a British missionary. A point to keep in mind when walking about solo is that the view towers are about two km leisurely walk away – many return upon reaching the lake shore one km out thinking that is the end of the walk – it is a V-turn from there with a small sign pointing the direction for the last leg. There are numerous spots along the way where nests, birds, and bats can be seen. The real treat is from atop the second view tower – from that vantage position one can see into the 14 acre island sanctuary - thousands and thousands of birds and nests– egrets, cuckoos, cormorants, racket tailed drongos, common rollers, teals, herons (night, purple, cattle), etc. 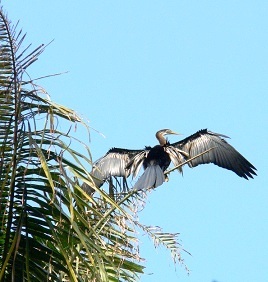 Local birds seen throughout the year include cuckoos, waterfowls, egrets, herons, cormorants, etc while parrots, teals, flycatchers, larks, and the Siberian cranes are migratory birds. Many of the wanderers come from the Himalayas while some come from as far away as Siberia. While it may be tempting, going off the concrete trail is discouraged as snakes abound. A visit to the Ayemenem house, where Arundhati Roy spent part of her childhood is a must for her fans. 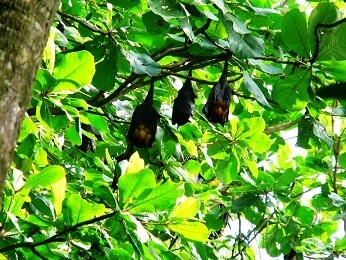 The place can be reached by boat along the Meenachil River. KTDC Water Scapes: Wonderful location inside the bird sanctuary and facing Vembanad lake. It is a heritage site associated with Alfred George Baker. Casino Group’s Coconut Lagoon: The place offers both a classy setting and excellent food. On the downside, the food is pricey and lighting is below par. Kumarakom Day-trip report (this post). Kumarakom KTDC Water Scapes - Day-out package - Review. Aquatourism by Matsyafed, Chembu - Day trip Review.